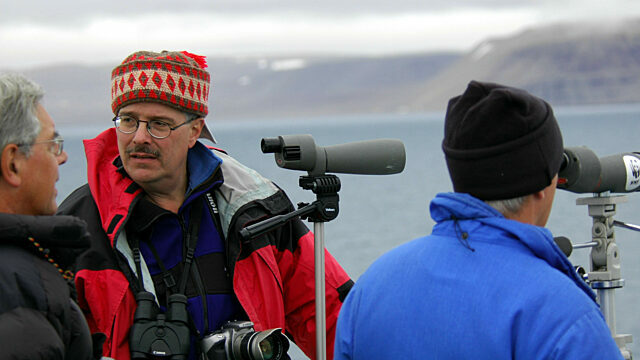 Pierre is a north Atlantic and Arctic marine mammal specialist, an avid birder, and a naturalist. He is happiest while outside looking for wildlife. Pierre has been an avid naturalist since his teens. He developed a keen interest in marine life and, in particular, whales, seals, and seabirds. Pierre was one of the first naturalists on board St. Lawrence whale-watching cruises in the 1970s. 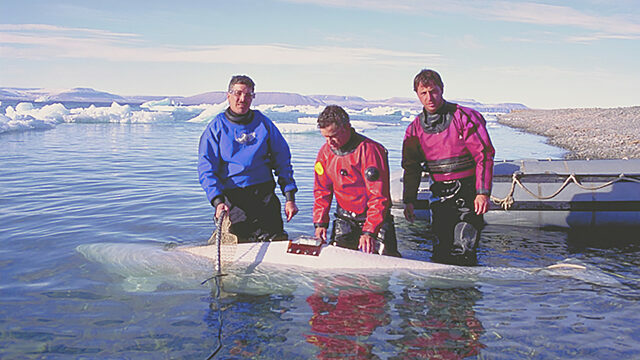 For thirty years, he was employed as a marine biologist and scientist at Fisheries and Oceans Canada, during which time he conducted field research on beluga whales, narwhals, and walrus. He has authored many scientific publications and three nature guides on marine mammals. Now retired from Fisheries and Oceans, Pierre can spend more time as a nature guide and naturalist interpreter, his first love. Since 2005, he has been a regular guide on Adventure Canada’s Arctic and Atlantic expeditions. An outdoor enthusiast in his spare time, Pierre enjoys bird-watching wherever he goes and has pursued that passion across the world. Pierre likes to be outside on deck, in a Zodiac, or on land looking for wildlife.